Shady's back, back on "Saturday Night Live" again. 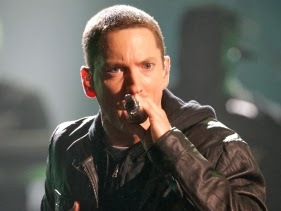 Eminem has five "SNL" appearances under his belt, and on November 2, just three days ahead of his The Marshall Mathers LP 2 release, the "Rap God" himself will storm Studio 8H as the show's musical guest. On Wednesday (October 16), just days after Katy Perry thrilled audiences with her new Prism single "Walking On Air," Billboard.comreported the news and confirmed that "Scandal" star Kerry Washington will make her debut on the episode as the show's host. There's a high-chance that the veteran MC will perform his #1 rap single "Berzerk," but could go in a number of different directions for his second song selection. "Survival," the MMLP2 cut that Em connected to the upcoming "Call of Duty" video game is an option, as is Slim Shady's latest release "Rap God." The six-minute track finds a fired-up Em spitting an arsenal of high-powered and densely layered rhymes, which once again prove his lyrical dominance. "Gotta fat knot from that rap profit/ Made a living and a killing off it/Ever since Bill Clinton was still in office/ With Monica Lewinsky feeling on his nutsac," he raps. Perhaps Em will perform a song that fans haven't heard yet. If he wants to bring a guest his new album boasts what look to be some pretty coolfeatures from Rihanna, Kendrick Lamar, Skylar Grey and Nate Ruess from Fun.